Welcome to our new series, “Meet the Fam,” where we are highlighting and interviewing some of our awesome regular contributors. Our contributors are what makes Life Goals Mag come to life and we want to give you all a real glimpse into what they’re all about. Tess Brigham is up first. She’s a therapist and twenty-something love and life coach. 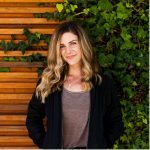 She has so much insight on getting through your twenties and we were thrilled to pick her brain for an interview. Enjoy! Tell us about yourself. Who are you, what do you do, and what lights you up? I’m a twenty-something love and life coach. I’m also a licensed therapist with over 10 years of experience working with individuals, couples and families. For the past 5 years I’ve been focusing on helping twenty-somethings figure out who they are and what they want from this life. My goal is to help young people go into their 30s, 40s, 50s with clarity and confidence. One of the most rewarding parts of being a coach and therapist is seeing your clients grow and change. There’s nothing better than when a client tells me that they feel confident enough to make a career shift or that they finally let go of a destructive relationship. What do you think someone’s “best self” looks like in their twenties? To me, being your best self means that you’re living your life aligned with your own values and beliefs. Growing up your parents, friends, teachers all weighed in on what you “should” be doing with your life. Those aren’t your “shoulds.” They’re based on someone else’s thoughts and beliefs, not yours. My goal is to help you figure out what’s right for you. You and only you have to lay your head down on your pillow every night, so what you do for a living needs to give you meaning and who you date and spend time with needs to lift you up, not bring you down. What do you wish you could tell yourself when you were 20 years old? I would tell myself not to be in such a rush to reach my goals. I spent most of my 20s working towards a career that I eventually left. I kept telling myself that I could travel later, or visit my friends later or take up that hobby later. The problem is you don’t know what life is going to look like later, so if you want to change something – do it. Don’t put off enjoying the smaller things in life while you’re working towards the bigger things. Your big dreams and goals (whatever they may be) will still be there. Unique opportunities to travel or to spend time with a good friend, that won’t always be an option. You wrote a lovely article about millennials getting a bad rap (which we loved), what do you think makes millennials an important generation? On the flip side, what do you think millennials need more of? I didn’t know much about Millennials until several twenty-somethings showed up in my therapy practice. As I heard them tell their stories, I remembered how exciting and overwhelming the transition from college to “adulthood” could be. As I got to know many of these clients, I realized that many of the challenges they faced were completely new and something that neither myself, nor my own parents, had to deal with – social media. I can’t imagine what it’s like to try and figure out who I am and what I want without being reminded on a daily basis that my friends are having a good time without me or that my ex boyfriend is now with someone new. Navigating the transition into adulthood is very different than when I was in my 20s. Millennials need to know that happiness is not a guarantee, nor is it the only thing you should strive for in work and in relationships. There is a big disconnect between the messages each generation was given growing up. Baby Boomers were raised with this idea that if you work hard, success will come. Boomers weren’t raised with the notion that happiness is a guarantee. As a Generation Xer myself, I was taught that I could do anything I wanted but that it would take hard work and that happiness is out there, but I need to find it for myself. Millennials were told they could do or be anything they wanted and by doing that you will be happy. Millennials are seen as entitled and spoiled, which they aren’t, they just weren’t given all the facts about life. While Boomers were raised with low expectations, Millennials were raised with high expectations and combine that with social media telling you that money, success, beauty, happiness is out there makes it even harder for young adults to be realistic about life. We think the goal in life is to be happy but it’s not; it’s about finding meaning in what you do whether it’s being a CEO of your own company or if it’s raising 3 strong, intelligent kids. What’s happened is Millennials expect a job or a relationship to bring them happiness and when they’re in the daily grind of work and they’re not happy, they start to question the job and look outside of themselves for what will make them happy. No one is happy all day, every day. That’s not the goal you’re trying to achieve. It can be hard to remember that because when we scroll through our Instagram feeds all we see are happy people doing fabulous things. What advice can you give to someone in their twenties who is just starting out in their career? How about starting a new relationship? So many twenty-somethings get mixed messages about what they should be looking for in a career. When we’re in college, we’re asked to pick a major and somehow that one decision is supposed to shape a big part of our lives. It’s completely unrealistic. During your twenties, you’re really trying to determine the things that you don’t want to do more than the things that you do want to do. Don’t get caught up in being on a specific career path. Your goal is to gain skills that people would be willing to give you money to perform. Every job teaches you skills that you really enjoy and find that you’re good at. At the same time, you’re also learning skills that make you want to pull your hair out. You want to be able to take that knowledge of what you love and what you hate as you narrow in on your ideal position. We’ve learned that “follow your bliss” isn’t always the answer. True job satisfaction comes having meaning and autonomy. Passion comes from mastery. We develop a love for something as we learn it and do it and get more confident and comfortable with it. This means that you’re going to have to spend some time doing a lot of jobs that you don’t really like. Love is always tough. It’s tough because you’re not only dealing with yourself and all of your “fears and worries” but you’re dealing with someone’s else “stuff” as well. That’s one of the hardest parts of life to accept, that you can meet someone that you really connect with but they may just not be ready for a relationship. It hurts and it’s painful but timing is a big part of why one relationship works out and another doesn’t. I always recommend that whether you’re in a relationship or not, to make a list of your ideal partner. This will get you thinking about the kinds of qualities you’re looking for in another person. Since women are usually the ones being pursued, we tend to just pick whatever guy or girl approaches us and then we decide if we like them enough to go out. Women need to have an idea of what they want so that when they meet someone it’s very clear if he or she meets their needs. It’s not about rejecting some guy because he’s too short. It’s about not getting involved with someone that may be attractive but violates your personal boundaries. Women tend to invest a lot of time and emotional energy into the people they date – so make the investment worth it. On your website, you talk about going from confusion to clarity, what is one tip you can leave us with about finding clarity when we’re feeling lost and unsure of ourselves? Usually when we’re feeling lost and confused we want to try and find the answer to our problems yesterday. We ruminate, we consult with friends, we look at our horoscopes, we call mom and ultimately what happens is that we still have the problem and now we have 10 different opinions about what to do. The answer is usually somewhere inside of us but we can’t see it because our fear gets in the way. When fear takes over we get stuck and then just go in circles – debating the same things over and over again. The reality is you can’t experience love without fear. And that’s not just romantic love but love of a career, love of a home, love of a certain lifestyle. In order to experience love, there will be fear. If you’re trying to make a decision, instead of trying to push down your fear or ignore it – accept it and embrace it. I always encourage my clients to do something scary but doable. It needs to make you a little afraid or you’re not really challenging yourself but it has to feel doable or you’ll avoid it forever. If you’re unsure if you should leave your current job and pursue a new career, what can you do that’s scary but doable? What about reaching out to a friend of a friend who has a job that you think you might like better? What about taking a class? What about taking on a project at work that will really challenge you? Clarity comes from action. Start taking action and the answer will begin to appear. Even better – it’s your answer – not your mother’s. You can browse Tess Brigham’s articles on Life Goals Mag here and check out her website here.